Benji's a contender — and a self-made millionaire. AUSTRALIAN Survivor contestant Benji Wilson dropped a bombshell during last night's episode, declaring he's a "self-made millionaire". 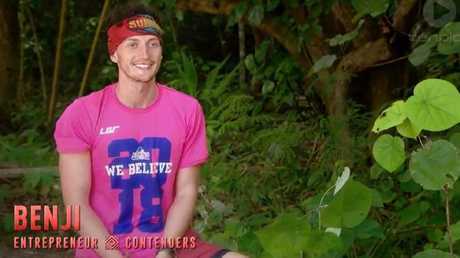 The 26-year-old "former competitive basketballer" had stayed in the background for the first few episodes of this series, but last night's surprise revelation has led some to question why he was placed on the 'Contenders' tribe when the 'Champions' might've been a better fit. "When people look at me, they assume I'm a dumb jock and a college dropout. What they don't know about me is I'm actually a seven-time Amazon bestseller and a self-made millionaire," he revealed. "I think I'm a natural entrepreneur … by the time I was 25 I'd built a business online that's now worth a million dollars." Benji last night revealed he was a seven-time Amazon bestseller. So what is this business whiz's secret to success? His official bio on the Australian Survivor website offers more information, but little in the way of clarification. "Benji says he is a self-made millionaire working in some of the biggest places in the world from New York to Brazil," the bio states, before a bizarre quote from Wilson himself in which he admits to publishing books under his own name … that he didn't actually write himself. Moving to Brazil, "I took on four different jobs, learnt algorithms and went onto become a best-selling author by paying other people to write books for me then used my marketing skills to sell them under my name. I even booked speaking gigs at universities in the US. I've never looked back and now run multiple businesses that bring in over one million dollars, just four years later." Wilson's Amazon author page lists just one, 52-page out-of-print paperback to his name. 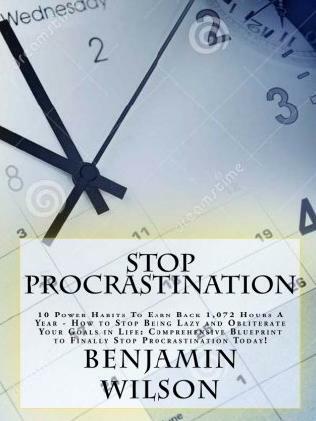 It's the catchily-titled Stop Procrastination: 10 Power Habits To Earn Back 1,072 Hours A Year - How to Stop Being Lazy and Obliterate Your Goals in Life: Comprehensive Blueprint to Finally Stop Procrastination Today!, published in 2014. It's unclear if it was one of his aforementioned bestsellers. Benji on Survivor. Picture: Nigel Wright. "The lack of editing made the book difficult to read. I completed it, but it is hard to take anything seriously when it is full of typographical and grammatical errors," reads the top critical review under the title. "I expect an occasional error in these self-published titles, but after the first few pages the errors in this one were bothering me so much I could not take in the message. A simple spell and grammar check in MS Word would have caught many of the problems." However, the book did receive a number of glowing five-star appraisals - take this review from 'Hannah': "I am probably the biggest procrastinator you could find. I was looking for some solution and I found this book. I think it gives great advice. It all makes sense to me. I didn't even realize how much time I've been wasting. Now is the time to change it. Let's put all these tips in action and stop procrastinating." Wilson's other businesses include online courses in social media with titles such as 'Instagram Marketing 2018: A Step-By-Step to 10,000 Followers' (Wilson himself has almost 30,000 followers on Instagram). 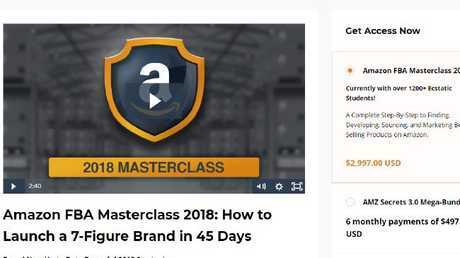 He has also co-founded a business called Freedom Formula, offering an online 'Amazon FBA Masterclass' at a cost of $US2997 per person. The online masterclass offered on Wilson's 'Freedom Formula' website. In last night's episode, Wilson said he'd been "hustling" his whole life - and bragged that if he were to win the $500,000 Survivor prize money, it would actually represent a pay cut compared to his earnings at home. 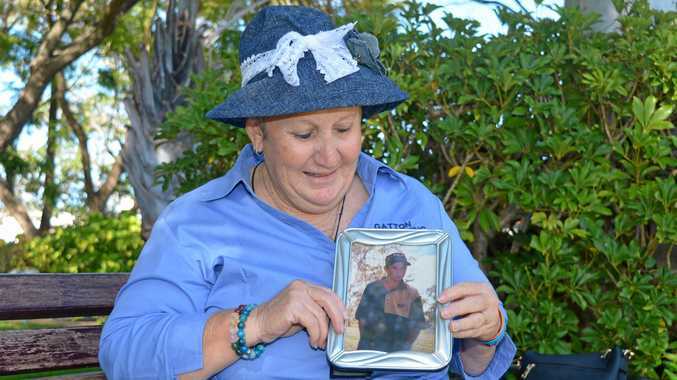 "I don't need the money - I'd make more money staying at home than I would out here. I want the title. That's what I'm out here for, and the money just comes attached to that title, so I guess I'll take it too." "I dropped out of a full ride basketball college scholarship in New York and decided to forge my own path in life. I moved to Brazil with my friends, with almost nothing left in my bank account, and I hustled in order to build my businesses to create a life that I love. I now live a life where I don't have anyone to answer to and spend my time travelling the world. "When I moved to Rio I used to stay up all night working online. I applied for an online job at Google that paid me $50 an hour but I didn't want to settle with that. I ended up creating two other aliases, completing Skype video interviews in literal disguises and then worked all night with three different computers set up - making myself $150 an hour 30 days after dropping out of college." Which category do you think you fall into - brains, brawn or beauty? "I would definitely fall into the brain category. I got a 4.0GPA in order to get myself a scholarship to college in the States and I see the world from a completely different perspective to others and always find a way to get what I want out of life and have a blast doing it." Is there anything you'll be keeping secret from your competitors? "I am a self-made millionaire and I don't struggle to afford many things. I will be keeping that a secret and I hope to have that information leak only when it's beneficial to me." 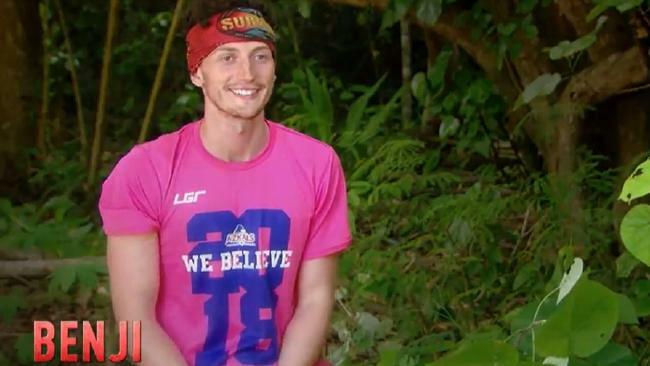 Another interesting fact about Benji, Survivor fans: He's the brother of Anneliese, who competed on the show last season. She lasted 38 days, finishing 11th out of 24. Australian Survivor: Champions vs. Contenders airs 7.30pm Mondays to Thursdays on Ten.